Known as Pema Jungné (‘the lotus-born’) or Guru Rinpoche (‘the precious guru’) in Tibet, Padmasambhava is seen as the true founder of Tibetan Buddhism, a second Buddha who established the dharma in the land of the red-faced men. Padmasambhava is said to have been invited to Tibet to help found the first Tibetan monastery, Samyé, and tame the local demonic forces that were obstructing the establishment of the monastery. In the earliest histories, Padmasambhava’s role is limited to this, and perhaps to introducing the technology of irrigation to the valleys of Central Tibet. In later histories, Padmasambhava’s role is far greater. In particular, his is said to have concealed uncountable books and sacred objects throughout Tibet, for discovery when the time became ripe. The discoverers are the famed tertön and the hidden treasures are the terma. The great and secret instructions of the tathāgatas. Two things about these verses interest me very much. The first is the similarity of the first line (the second line in my translation) to the Seven Line Prayer, a much more famous set of verses of praise to Padmasambhava which is still recited today. Śāntigarbha’s verses seem to have been a forerunner and source for the Seven Line Prayer. The second interesting aspect of these verses is the reference to bringing secret instructions out of the valleys. The “valleys” may be a reference to Oḍḍiyāna, Padmasambhava’s homeland, which also happens to be where many tantras are said to have entered the human realm. The association of Padmasambhava with the revelation of tantras (not found in any history) is a surprising link to the later terma tradition, not in the traditional sense in which he is said to have concealed the terma, but as a revealer of treasures himself, a model for the later tertöns. Finally, just in case I have given the impression that Padmasambhava actually wrote this manuscipt, let me be clear that he didn’t. The scribe has signed the manuscript, and we can see that he was a local to the Dunhuang area, probably a Chinese from Ganzhou, who went by the name Kamchupa Buoko. 1. Dalton, Jacob. 2004. “The Early Development of the Padmasambhava Legend in Tibet: A Study of IOL Tib J 644 and Pelliot tibétain 307.” Journal of the American Oriental Society 124.4: 759-772. 2. Eastman, Kenneth. 1983. “Mahāyoga Texts at Tun-huang”. Bulletin of Institute of Buddhist Cultural Studies (Ryukoku University) 22: 42–60. 3. Germano, David. 2002. “The Seven Descents and the Early History of rNying ma transmissions.” The Many Canons of Tibetan Buddhism (eds Helmut Eimer and David Germano), Leiden: Brill. 225–263. 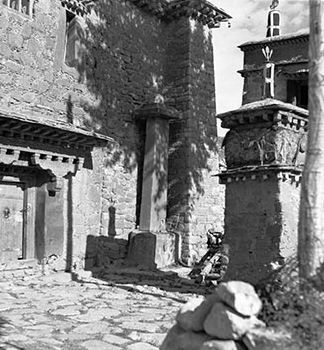 The Temple of the Hat (Zha’i lha khang) is a small temple about 50 miles northeast of Lhasa, founded by the monk minister Nyang Tingdzin Zangpo, a significant figure in Tibetan religious history. 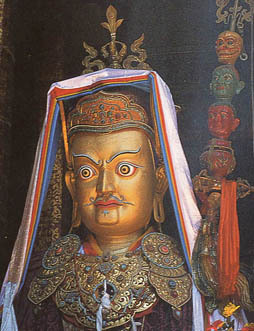 Nyang was one of the first Tibetans to be ordained as a monk after the completion of Samye temple. He acted as guardian to the young prince who later became King Senaleg (who ruled between 799 and 815). Later religious history includes Nyang as one of the 25 disciples of Padmasambhava, and even more importantly, as the recipient (along with King Trisong Detsen) of the Seminal Heart (Nyingtig) teachings of Dzogchen from Vimalamitra. These teachings are said to have been concealed in the Temple of the Hat and rediscovered in the eleventh century. Bandé Tingdzin, has been loyal from first to last, and from my childhood until I obtained the kingdom he took the place of a father and mother and acted with devotion to my welfare. The two pillars are of different dates. The pillar to the west of the temple entrance is the earlier, probably dating to 804–5, while the pillar to the east of the entrance is dated to 812. At the end of the west pillar inscription it is stated that a detailed document of this edict was written and placed in the archives while a sealed copy was been placed in a special enclosure, perhaps in the temple or even within the pillar itself. The last part of the edict states the procedures for re-opening the enclosure (presumably if there was a need to check or update the edict), and for resealing and re-depositing the edict. Now, the depositing of edicts in special rooms and the procedures for opening and resealing them seem to prefigure the later hidden treasure (terma) tradition. The Dzogchen texts which were were said to have been hidden here at the Temple of the Hat by Nyang Tingdzin Zangpo are part of the collection known as the Vima Nyingtig, perhaps the earliest of the hidden treasures. According to an early history, The History of the Seminal Heart, these texts were rediscovered by a certain Denma Lhungyal in the late 10th or early 11th century. Apparently the treasure texts were hidden in three places in the temple: (i) inside its storeroom or treasury, (ii) in the gate house or vestibule, and (iii) in a hole inside one of the pillars. As Ronald Davidson has pointed out, the old imperial and temple archives were undoubtedly opened up when monks returned to Central Tibet in the late 10th and 11th centuries. They probably found something in these old archives. 1. Davidson, Ronald. 2005. Tibetan Renaissance. New York: Columbia University Press. p.215. 1. Photograph of the two pillars at the Temple of the Hat, by Hugh Richardson. 2. 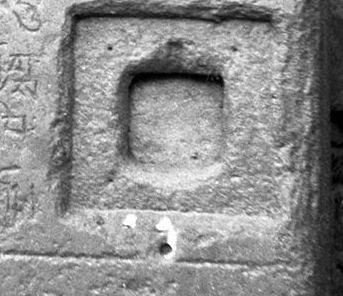 Photograph of the seal socket in the east pillar, by Hugh Richardson. These images are copyright of the Pitt Rivers Museum, Oxford. See their website: The Tibet Album.